Other common symptoms include: bloating, nausea, diarrhea, night sweats or chills, brain fogginess, dizziness, shortness of breath, chronic cough, visual disturbances, allergies or sensitivities to foods, alcohol, chemicals, irregular heartbeat or palpitations, jaw pain, or eyes or mouth. There are many different theories of the cause of CFS, although none have been proven. 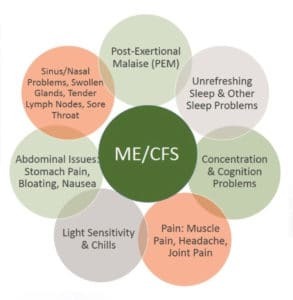 Researchers do agree however that there are multiple factors that contribute to CFS including infectious agents (viruses, bacteria, candida, parasites etc), immune dysfunction, thyroid problems, toxicity (from environment, food, dental amalgams, and drugs), enzyme deficiencies, underlying allergies, nutritional deficiencies and lifestyle factors (stress, emotional and psychological factors). Adrenal extracts help to repair and restore normal adrenal function which is severely depleted in Chronic Fatigue Syndrome. Theses herbal formulations are used to replenish and eventually normalize adrenal function. They have a strong advantage over prescription adrenal hormone replacement in that they can be immediately discontinued once they have done their job of repairing adrenal function.They also increase energy and help to speed up the recovery time from illness. Certain herbs also have a direct impact on the adrenal glands. Herbs such as Siberian ginseng (Eleutherococcus senticosus), Licorice root (Glycyrrhiza glabra), Borage (Borago officinalis), Ashwagandha (Withania somniferum) are classed as adaptogenic herbs. Adaptogens strengthen the adrenal glands and help the body to adapt easier to emotional and physical stress. Vitamin C is the most important nutrient in facilitating adrenal function and repair. Daily Vitamin C supplementation and weekly IV administration has shown to increase the strength and function of the adrenal glands. Removing toxins from the body is an essential phase in restoring health and vitality. Every year people are exposed to thousands of toxic chemicals and pollutants in air, water, food and soil. People living today carry within their bodies a “chemical cocktail” made up of industrial chemicals, pesticides, food additives, heavy metals, general anesthetics and the residue of conventional medications. Today, people are exposed to chemicals in far greater concentrations than were previous generations. For example, about 3000 chemicals are added to the food supply and as many as 10,000 chemicals- in the form of solvents, emulsifiers, and preservatives- are used in food processing and storage which can remain in the body for years. Detoxifying the body is another component in promoting the health of the immune system and addressing other factors that may be contributing to the Chronic Fatigue. As our environment and food are increasingly saturated with chemicals, the body’s mechanisms for elimination of toxins cannot keep up with the chemical deluge. The constant circulation of toxins in the body taxes the immune system, which must continually strive to destroy them. When combined with multiple infections and nutritional deficiencies, this toxic overload may be the proverbial last straw in the development of CFS. Given that many people suffering from Chronic Fatigue have chemical allergies it is advisable to take measures to remove the toxins stored in the body. Intestinal permeability occurs when the lining of the digestive tract becomes permeable (leaky) to toxins that cause chronic inflammation. Intestinal permeability allows toxins to leak out of the digestive tract and into the bloodstream. This triggers an autoimmune reaction that can create pain and inflammation in any of the body’s tissues. The use of medicaitons such as steroids, antibiotics, antihistamines, caffeine, alcohol, and other prescription and nonprescription drugs renders the intestinal mucosa permeable to toxins and undigested food particles which becomes fuel for the fire of the person suffering from Chronic Fatigue. Most individuals with Chronic Fatige are plagued with intestinal permeability. A treatment program designed to pinpoint the allergenic foods to heal the gut and detoxification can help to heal those suffering with CFS. There are many natural treatments to lessen the severity of the symptoms and to reverse the underlying causes. Naturopathic medicine can help people get their health back and live life with abundant joy, peace and well-being. Each individual may have Chronic Fatigue Syndrome for various reasons and would therefore require different treatment protocols. The importance is in knowing that each person will respond in their own unique way to treatments and therefore there is no cookie-cutter approach to treating Chronic Fatigue. If you are suffering from Chronic Fatigue Syndrome and looking for a Holistic approach to heal, please contact the office here to schedule your appointment to begin.